We are excited to announce our recent investment in Cypress.io. Cypress has built a next-gen front-end test automation product for modern web applications. 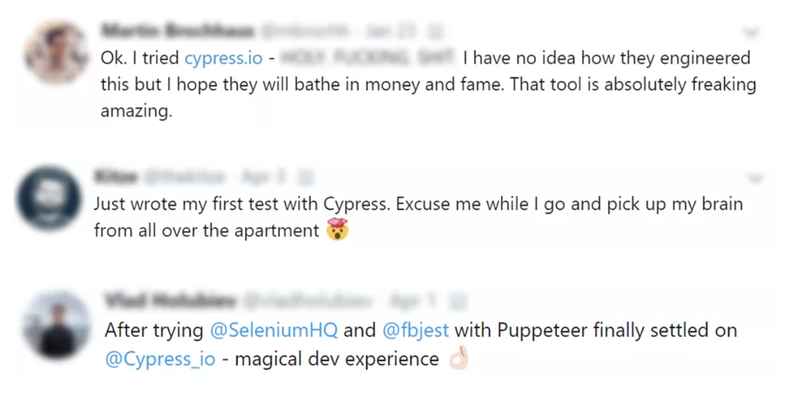 Cypress’ open source test runner is quickly gaining adoption among developers as a replacement for the widely used Selenium toolkit. We are proud to be partnering with CEO Drew Lanham, Founder and CTO Brian Mann, and the rest of the Cypress team as they continue on their mission to empower developers to spend more time building great apps and less time worrying about testing. At Bessemer, we have long been fans of developer-centric businesses, and we have published many of our thoughts on the space, including our eight laws of developer platforms. Cypress is a rare business that checks all eight boxes, and excels across many dimensions. This all starts with a product that delivers a delightful and intuitive user experience, runs tests dramatically faster than incumbent products, and is more reliable than any other test automation framework. Our decision to invest was driven largely by two main factors: first, the strength and passion of the team, and second, the outrageous developer love for Cypress’ product. The first factor was immediately clear upon meeting Drew and Brian and hearing the story. The second factor took a little more digging to confirm, but pretty quickly after speaking with users and taking a look Cypress’ Twitter feed, we were convinced. In our minds, one of the most important pieces of a great developer platform business is outright, emphatic “developer love.” After all, the developer community is extremely well-informed about what tools they need and they are generally averse to being sold to in the traditional sense. Therefore the only way to build a successful developer platform business is to start with a product that genuinely makes developers’ lives easier and provides a dramatic improvement over the status quo solution. The flip side is that once you clear this high bar, developers are very good about praising the tools they love and sharing their reviews publicly. Building a successful developer platform business also requires the company to be actively engaged in fostering a thriving community, and over the past few years, Cypress has done just that. Today, Cypress has grown the community to tens of thousands of users with over 100 million recorded tests. They have done so by listening closely to their users’ needs and delivering features that truly delight them. We are extremely excited to work with this team and help them continue to build out more great tools that will enable developers to easily run more frequent tests as they code, and waste less time debugging broken apps. We are proud to welcome Cypress to the Bessemer portfolio, and encourage anyone building modern web applications to check them out.